I have a mild love for fabric covered buttons. I think they just add the perfect flair for any project. Until someone told me about the inexpensive kits sold at fabric stores I had no idea how easy and accessible they were to me so I figured some of you might not know either. You can find the kits on the notions wall at the fabric stores. I like the kind of kit that has the round rubble thing. They have another kind that you use with a hammer and I think those are harder to use and easier to mess up. 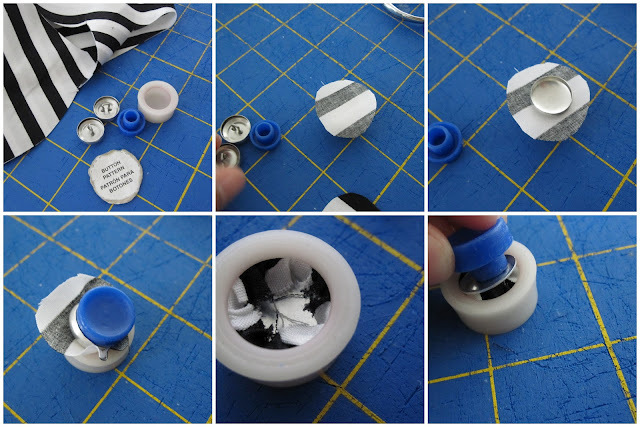 These buttons are fabulous to use in sewing projects but they also sell ones with flat backs that can be glued onto hair thingies, earrings, and more. There will be a pattern to use to cut your fabric. I recommend cutting it a little larger. Next you put the fabric on top of the cup piece. Next place the button face part and push down with the tool provided. This step may take some practice to get an equal amount of fabric around the edge. Use your finger to press down excess fabric. And you’re done ready to use your cute new button. I used mine for a birthday present I made for a little friend. I’m hoping to make myself some cute hair pins soon though. Hey marissa, thaks for the mini tutorial ! I’ve just made a little clutch that’s crying out for SOMETHING to finish it off, think a few fabric covers buttons might just be the thing ! That is cute. I love the colors. Thanks for sharing. Oh cool! I never knew you could make fabric covered buttons. I need to look for that kit. I love fabric buttons and the romper is adorable. Very cool. It’s neat how easy this really is. Thanks so much for sharing this post at Romance on a Dime!! I’m pinning this. Fabric covered buttons are such a great way to add spice to a project. I love the black and white ones you used with the turquoise corduroy. Those are too cute! I am going to have to go pick up that little kit! Thanks for sharing at the Pomp Party! Pinning to our Pomp Party board! I had no idea that covering buttons was so easy (at least it looks easy to do). They really do make your coveralls pop. Thanks for sharing at our party this week.